Maker Corps is an online professional development program and network that provides training and a community of support to youth-serving organizations as they design and implement summer maker education programming. Each partner site hires Maker Corps Members to facilitate their summer maker-centered programming and help design programs behind the scenes. Throughout the summer, Maker Ed supports partner sites and Maker Corps Members as they work through particular topics or challenges that arise over the course of the implementation of maker education programming. This is done through recorded weekly Maker Corps Summer Sessions webinars, as well as the facilitation of rich community dialogue on an online community. Maker Corps partner sites are youth-serving organizations, such as science centers, children’s museums, schools, libraries, and community organizations, looking to develop or grow their maker education programming in order to provide young people with opportunities to tap into and expand their creativity, curiosity, and confidence. Leadership at partner sites provides day-to-day supervision of at least one Maker Corps Member who is employed at their site during the summer. 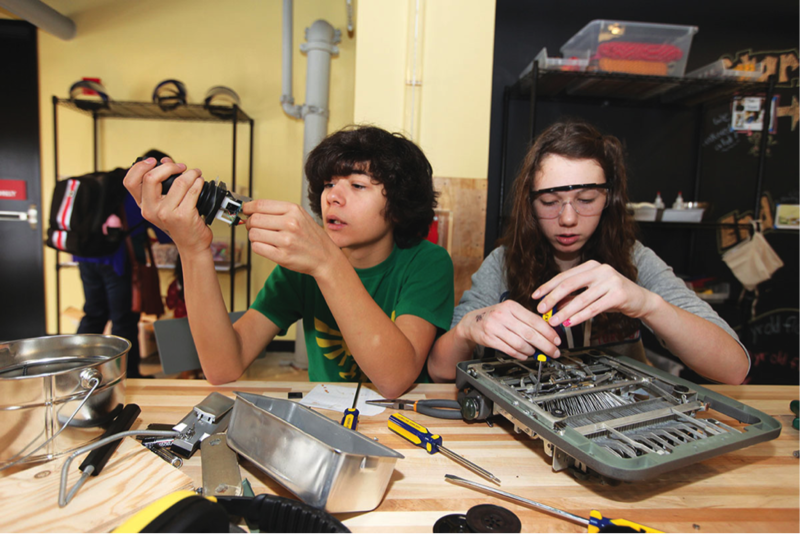 Maker Corps Members come from a large variety of backgrounds and levels of experience. The majority of Maker Corps Members are either (1) college students or teachers who are hired for a summer position or (2) current staff members of the organizations who are passionate and committed to bringing making into their communities. At their sites, Maker Corps Members provide direct service making opportunities to youth and families, as well as develop new programs and ideas as makers-in-residence to build the capacity of the organization. Check out our detailed Maker Corps 2017 Program Description to learn more. Maker Corps is made possible by Cognizant with support from Chevron & Google.org.